Nutrition is so important during the first few years of life for babies and toddlers since they grow so much during this time. But it can be so hard for parents to give their little ones a wide variety of foods consistently. 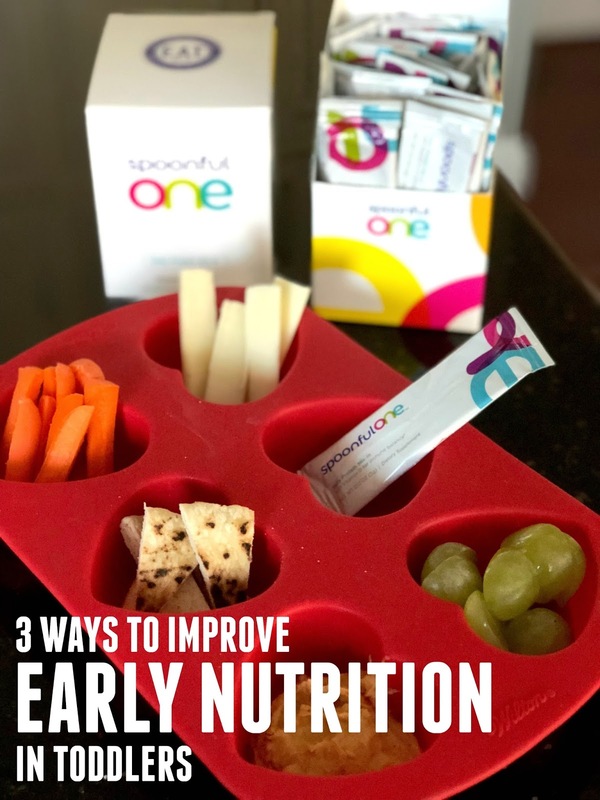 Today we are partnering with SpoonfulOne to share three simple tips to help improve early nutrition in toddlers along with some ideas to help you make it happen. Making healthy food choices can impact your child's physical and emotional health. Healthy Children shares some simple suggestions here to help you make sure that your child is well-nourished. In our home, we like to get the kids involved in planning and preparing meals so that they are more invested and excited about what they are eating. We love to have the kids help measure out ingredients, press buttons on the mixer, wear an apron, and even count out scoops of flour or pasta. Since children should consume food from a variety of food groups each day, we like to take our kids on grocery shopping scavenger hunts to find fruits and vegetables and we even work together to plan out our meals each week. The kids each get one night where they are in charge and they select what we will be serving for dinner. We work together to make sure that the meal is balanced. Another way we like to help our kids get a variety in their diet, is by creating simple muffin tin meals or doing a muffin tin taste test. Each spot in the muffin tin has either something to dip into or eat. Current favorite items include: cheese, carrots, grapes, hummus, tomato soup, and pita bread. I love to throw in a few favorites along with a few unfamiliar veggies to help expose kids to new things. We also love to read books about fruits and vegetables with the kids to help them learn the names and talk about healthy eating together. I Will Never Not Ever Eat a Tomato by Lauren Child is pretty funny and Eating a Rainbow by Lois Ehlert is a great way to learn new words. One thing that is on our agenda for this spring is to have the kids help us plant some veggies and fruits in a container garden. Getting kids involved with growing their food can also really help them be more excited about eating it! Staying active can increase your mood AND starting young can help kids lay a foundation for a healthy and active life! Being active can help promote healthy growth and development and help kids build strong muscles and bones. It can also help them develop a variety of physical, social, and emotional skills! At our house, we don't usually get toddlers involved in organized sports, but we set up an active family culture where we do a lot of things together indoors and outdoors to help kids move. We love doing family circuit training and having a family jogging club. We also ride bikes together and hike in the hills and trails near our community quite often. Our goal is to make sure that kids see us being active consistently and learn to find joy in being active... so that hopefully they'll follow our example as they grow. Here are 25 of our other favorite ways to burn off toddler energy and be active. Early nutrition is critically important during the first few years of child development. 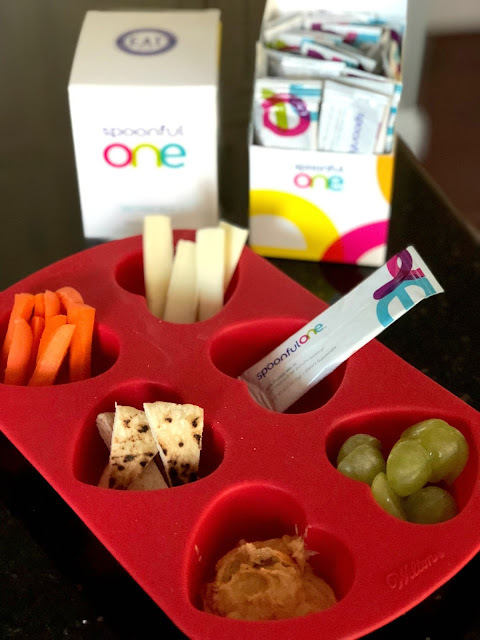 SpoonfulOne is one of the strategies new parents could use to be proactive and set a healthy foundation children's evolving immune system and reducing the risk of developing a food allergy. Two kids per class (and counting) now have food allergies and I recently learned that anyone can develop a food allergy, even if you do not have a family history of allergies. That's why we use SpoonfulOne in our home. It is a new, easy to use powder blend with gentle portions of all the foods responsible for 90% of food allergies. This covers not only peanut but all other common allergenic foods like shrimp, soy and other tree nuts that can be difficult to include into your child’s daily diet plus Vitamin D. New health guidelines recommend incorporating potential allergens into your child's diet early and often, and SpoonfulOne can easily help with that. I love it because there is no way that I could provide so many different foods over the course of the day to help my kids boost their immune health to help them from developing a food allergy, but I can definitely rip open a little packet, stir it into whatever we are eating, and help my toddler scarf it down. She loves mixing it into applesauce, hummus (in our tasting tray above), or oatmeal (to name a few of our favorites). SpoonfulOne was created by a Stanford pediatric allergist and mother of five. You can purchase a monthly subscription to keep things easy and always have your mix-ins on hand to add into your child's meal each day. 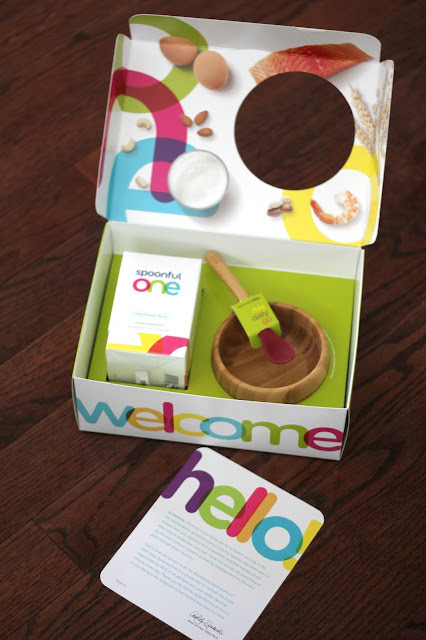 Each subscriber gets a welcome kit that includes a darling BPA-free bowl and spoon. Annabelle was pretty excited about it (and her muffin tin lunch!)! Here's a closer look at what we were eating and the simple SpoonfulOne packaging. The tiny packets are easy to store or stash in your purse if you are on the go. I'd love to hear what some of your favorite items would be to add to your child's healthy muffin tin meal! Can you share any? We are excited to partner with SpoonfulOne today and give away a 3-month supply to ONE lucky Toddler Approved reader! Giveaway starts on Wednesday, January 17, 2018 (midnight) and ends at 11:59pm on Tuesday, January 23, 2018. Please read additional giveaway rules here. Disclosure: This post is sponsored by SpoonfulOne. All opinions are my own.